It's not every mother's dream to sacrifice her hard-earned career to stay at home for the kids. But for some moms, it's the ultimate dream. I am one of those some moms. I didn't downright leave the workforce, though; I'm still working at home, so it's a win-win situation for both our family's finances and my baby's welfare. Being a work-at-home mom (WAHM) made a big difference to our family, I wouldn't have it any other way. The advantages of being a WAHM outweighs all the disadvantages, and I'm listing all the good reasons I have here for choosing the road less traveled. Working in an office entails a huge amount of money: transportation, food, and even your clothing—unless you have a work uniform. When you work at home, your household expenses drastically go down to a bare minimum. You don't need to spend on commute or gasoline (if you have a car), you don't need to eat out, you won't be tempted to buy stuff when your officemates do, and you won't need to spend on buying more clothes or new makeup. At home, you eat home-cooked meals, you don't need to change clothes every day so you can save on your laundry expenses too, and your transportation is limited to the weekly trip to the grocery and occasional visits to the doctor or the mall. When you work in an office, the first thing in mind is, who will take care of the baby when you're not around? It could have been easier if your mom or mother-in-law, or some other family member, is at home to stay with the baby. But not everyone has that advantage. It's probably far easier to find a needle in a haystack than finding a trusted nanny to look after your kid! Being at home, you don't need to worry about any of that. You're the main caregiver for your baby. You're there for every diaper change, every feeding, every sick time, and every single minute of her precious life. Whatever your kid needs, you're there for her—ready and available. Quality time with my baby is the main reason we decided that I work at home. That and the lack of satisfactory childcare. When I returned to my office job after giving birth, it was a whirlwind of waking up early to bathe and feed the baby before I get ready for work, of pumping like crazy in the office, of rushing back home at night before dinner, and of cursing at the traffic jam. You spend all your time trying to squeeze in all your responsibilities at work and at home, you barely have quality time with your baby. When I started working from home, things mellowed down. Our household was happier and more relaxed now that we didn't have to rush all the time. There will be more cuddles and kisses with your kid and your husband, more time to play, and more time for everything that matters. As a breastfeeding mother, it's paramount to provide unlimited opportunities for your baby to latch on your breasts. Nothing beats direct latch in boosting your milk supply and in providing your baby all the nourishment she needs. When you work in the office, you need to express your breast milk so that your baby has something to eat when you're not around. While you can supplement with formula, I'm a firm advocate of exclusive breastfeeding. I wasn't a big fan of pumping too. It's tedious and takes a whole lot of time. At home, my baby can take all her sweet time to breastfeed. I didn't have to worry about low milk supply because my baby can latch on anytime she likes. Breastfeeding got a lot easier now that I'm at home with her 24/7. When I gave birth to Kitkit, my heart melted into puddles when she opened her tiny little eyes and saw me for the first time. It was the happiest moment of my life. Being a work-at-home mom, I get to witness all of her firsts: her first smile, her first laugh, her first attempt at sitting down and standing up, her first squeal . 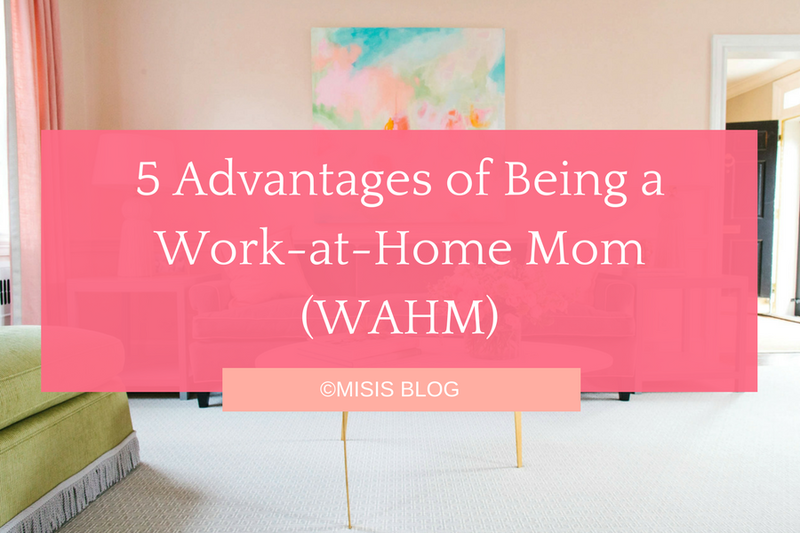 . . No amount of salary or prestige can outweigh the happiness of witnessing all of your child's milestones, and this is probably the biggest advantage of being a WAHM. Deciding to stay at home is a big decision every family makes. Believe me, my husband and I gave so much thought on this before taking the leap. When you decide whether to become a work-at-home mom, try to look on the bright side and factor in all the advantages it offers.